Ohio Attorney General and gubernatorial candidate Mike DeWine, left, discussed the future of Ohio with local Republicans on Wednesday afternoon at the Delaware County GOP headquarters. 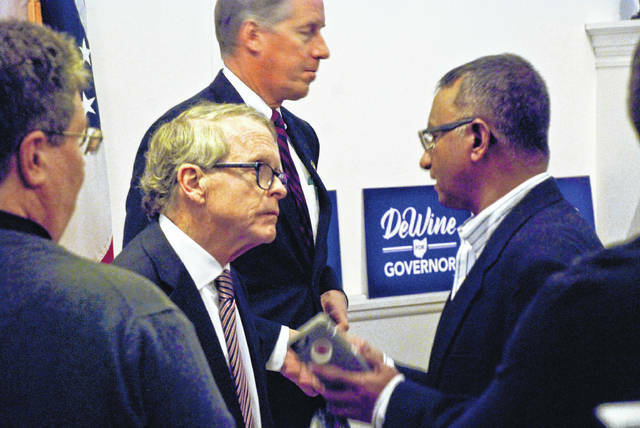 Ohio Attorney General and gubernatorial candidate Mike DeWine stopped by the Delaware County GOP Headquarters on Wednesday to discuss the future of Ohio. DeWine is one of four Republicans seeking the party’s nomination for governor. His opponents, so far, in the May 8, 2018 primary are Lt. Gov. Mary Taylor, Secretary of State John Husted, and U.S. Rep. Jim Renacci. DeWine said the state has an abundance of water and natural gas that will transform southwest Ohio. “It’s going to make us more competitive if we do it right,” he said. DeWine said only certain calls can be made by the boss or, in this case, the governor. DeWine said the state’s biggest obstacle to overcome is the opioid epidemic. DeWine said his plan is to begin education about the dangers of drug use at a very young age. This entry was tagged delaware, DeWine, GOP. Bookmark the permalink.